The Musqueam street signs contribute to a visible Musqueam presence and bilingual experience on campus. 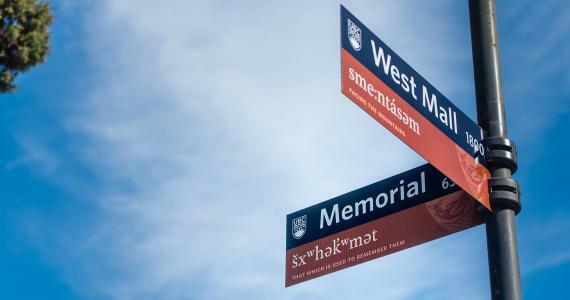 The Musqueam street signs were created in partnership with the Musqueam First Nation to give a bilingual experience while travelling on campus and acknowledge the linguistic heritage of the UBC’s Vancouver campus. The names do not refer to traditional sites but instead to UBC’s geography. For example, the word “middle” used for Main Mall reflects its central position on campus. Musqueam’s language, hən̓q̓əmin̓əm̓, uses a place-based directional system which refers to the land and flow of water (e.g. upriver or downriver, inland and towards the shore) and not cardinal directions such as north, south, east, and west. The names chosen by Musqueam seek to educate us about the way they perceive place, movement across the land, and to show everyone how their language and culture is intrinsically connected to their territory. 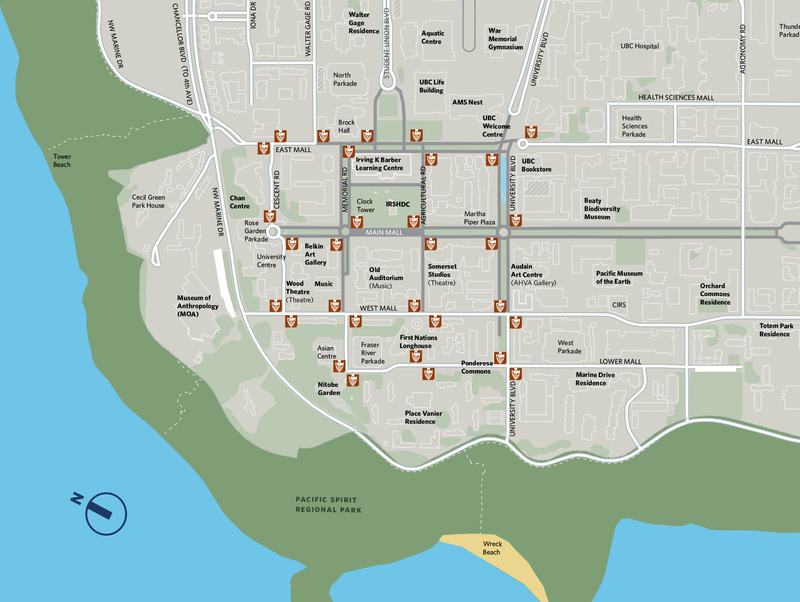 Read below to learn about the Musqueam street signs and to view a map with their locations. Listen to the street names in Musqueam’s language, hən̓q̓əmin̓əm̓. Special thanks to Vanessa Campbell from the Musqueam community for recording the audio clips. q̓ʷeχt was chosen for Agricultural Road as it means a place for cultivating food. xʷsel̕c̓əχən̓ refers to going around the perimeter of a building, denoting Crescent Road’s location near the edge of campus. cəl̕qʷas describes the location of East Mall, as to be facing East from its location is to face inland and away from the Salish Sea. stəywət describes the experience of walking along Lower Mall which is close to the shoreline and feeling a westerly wind off the Salish Sea. šxʷʔey̓eʔ describes the location of Main Mall which runs along the middle of the UBC Vancouver campus. šxʷhək̓ʷmət refers to the way we remember the people and events that have passed before us. sq̓ʷəlexélə refers to a bird’s nest, a reference to the “Student Nest” in the nearby AMS Student Union Building. šxʷyəθəstəm recongizes that the land on which UBC was built has been, and continues to be, a place of learning for the Musqueam people and for the world at large. sme:ntásəm describes movement north along West Mall as it faces the direction of the χʷte ʔə ɬəɬal̕wəɬ ct smənme:nt (North Shore mountains). The nine new street signs are installed alongside their English language counterparts at 54 locations in the centre of campus. We encourage you to walk around the UBC Vancouver campus to view the Musqueam street signs. As you stand near a sign, take note of where you are, and how the hən̓q̓əmin̓əm̓ names relate to your position on the land, in relation to the mountains and the Salish Sea. Visit musqueam.bc.ca to learn about the history, culture, and activities of the Musqueam community. To learn more about the land upon which you stand visit Musqueam’s online place names map. Campus and Community Planning is grateful for Musqueam’s support in the street signs project and for the guidance of the Musqueam Community, Chief and Council, Elder Larry Grant, Leona Sparrow, Jill Campbell, Vanessa Campbell, and Jason Woolman. Thank you to the Office of the President, First Nations House of Learning, UBC Building Operations, UBC Brand and Marketing, and UBC Media Relations. Also thanks to Ross Mills of Tiro Typeworks. We acknowledge that the UBC Vancouver campus is situated on the traditional, ancestral, and unceded territory of the hən̓q̓əmin̓əm̓ speaking Musqueam people.